Blizzard CEO Calls Out Those "Tarnishing Our Reputation as Gamers"
Blizzard president and CEO Mike Morhaime kicked off BlizzCon 2014 with a call to gamers to "redouble our efforts to be kind and respectful to one another." 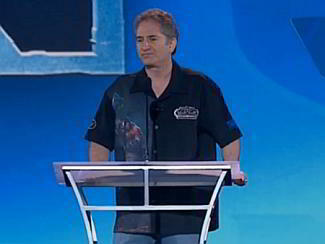 The opening ceremony for BlizzCon always has Blizzard CEO Mike Morhaime addressing the audience about what the company has in store for the show. But this year, in the first few minutes of his time on stage, Morhaime wanted to address GamerGate and the "small group of people ... doing really awful things and making some people's lives miserable." "Let's take a stand to reject hate and harassment, and let's redouble our efforts to be kind and respectful to one another," he said. "And let's remind the world what the gaming community is really all about."